The Disney double feature coming to Blu-ray in March has been fully detailed. As previously reported, Disney/Buena Vista will be releasing 'The Hunchback of Notre Dame / The Hunchback of Notre Dame II' on Blu-ray on March 12. Rediscover the majestic musical adventure of “The Hunchback of Notre Dame” and “The Hunchback of Notre Dame II,” together for the first time on Blu-ray in a 2-Movie Collection! Families can come together and enjoy the extraordinary tale of Quasimodo in a soaring celebration of the beauty inside all of us. 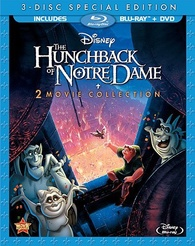 The Blu-ray/DVD combo pack will feature 1080p video, a DTS-HD Master Audio 5.1 soundtrack, and supplements include: The Hunchback of Notre Dame Audio Commentary; The Making of The Hunchback of Notre Dame; Behind the Scenes with Jennifer Love Hewitt; Multi-Language Reel: A Guy Like You; A Gargoyle's Life. Suggested list price for the combo pack is $39.99. You can find the latest specs for 'The Hunchback of Notre Dame / The Hunchback of Notre Dame II' linked from our Blu-ray Release Schedule, where it's indexed under March 12.